Once a route used by Native Americans to access spiritual sites in the Sangre de Cristo Mountains, Canyon Road today is home to one of the nation's most vibrant art markets. Attracting more than 1.5 million visitors each year, this street is famous for a historic style, character, and charm that are celebrated by visitors and locals alike. The American Planning Association has selected Canyon Road as one of 10 Great Streets in America because creative planning, zoning, and preservation programs have preserved and at the same time nurtured its rich local culture. Adobe structure under repair. Courtesy of Joe Burns. The 1.5 mile stretch of Canyon Road between Paseo de Peralta and Cristo Rey Church is a narrow corridor filled with one-story, common-walled structures that offers glimpses into the city's roots — the ancient village streets of Mexico, Spain, and Moorish Africa. Authentic adobe architecture is creatively interspersed with buildings in the Spanish-Pueblo Revival or American territorial styles, and many of the modest two- or three-room dwellings date back more than 100 years. This narrow and windy road, unpaved until 1960, provides a unique sense of place. 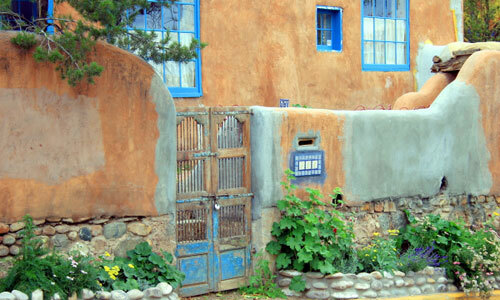 "Canyon Road has an intimate feel," says Jerry Porter, retired Santa Fe city planner. "Numerous buildings are set right at the street edge." That intimacy, combined with one-story buildings and narrow sidewalks, creates an inviting experience for pedestrians. 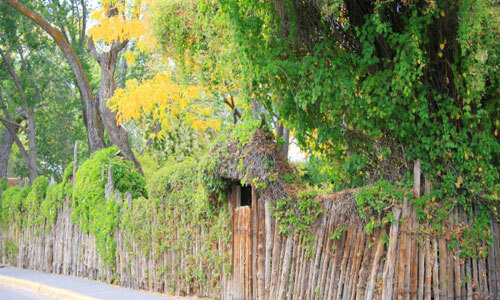 Old trees line and shade the streets; native landscaping, such as wildflowers and sage brushes, enrich the vistas; and uneven juniper pole "coyote fences" (named after the animals that they are meant to keep out) aptly demonstrate the region's unique "southwestern" style. Perhaps most stunning are the strong contrasts and colors: turquoise skies mix with brown adobe walls, snow-capped mountain peaks rise above rooftops. The buildings themselves are works of art — doors and gates all painted in rich shades of turquoise, purple, red, and yellow. Throughout much of its history, Canyon Road existed as a quiet farming community on the city's outskirts. Its turning point came in the 1920s when a group of painters settled on the then dirt road and began selling artwork from their homes. The presence of these nationally recognized artists, known as "Los Cinco Pintores," slowly transformed Canyon Road into a thriving art community. To accommodate this transformation and preserve its architectural heritage, the city made two important planning decisions. First, it adopted the Historic Style Ordinance in 1957. Championed by Irene von Horvath and drafted by author Oliver LaFarge and architect John Gaw Meem, this ordinance prevented permits for buildings that did not reflect Santa Fe's architectural heritage. Second, the city established Canyon Road as a Residential Arts and Crafts District. This zoning technique allowed local artists to sell their works from their homes. View of the Waxlander Gallery & Sculpture Garden. Courtesy of Joe Burns. 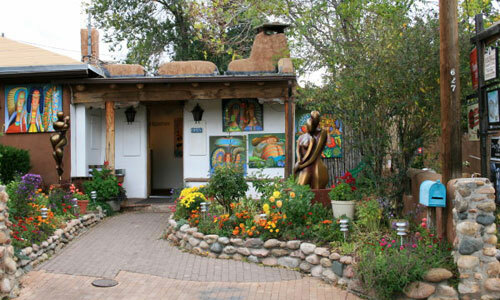 Today, dozens of old adobes and traditional Spanish have been converted into galleries and studios, many featuring traditional and contemporary Native American and Spanish arts, crafts, and sculpture. Shoulder to shoulder with restaurants and bars where one can find world-class Spanish classical guitar, flamenco, and jazz, the combination keeps the road lively and unique. While Canyon Road, like many parts of Santa Fe, has faced challenges of affordability, it also is a vital component of the city's art-based economy that provides some 2,500 jobs and $54 million in annual tax revenues. Style, character, and charm, long the hallmarks of Canyon Road, help set this street apart. While its evolution is not complete, Canyon Road's future looks bright. Creative planning, zoning, and preservation programs are enabling this historic street to embrace the future without losing sight of its past. View of a 'coyote fence' along property line. Courtesy of Joe Burns.